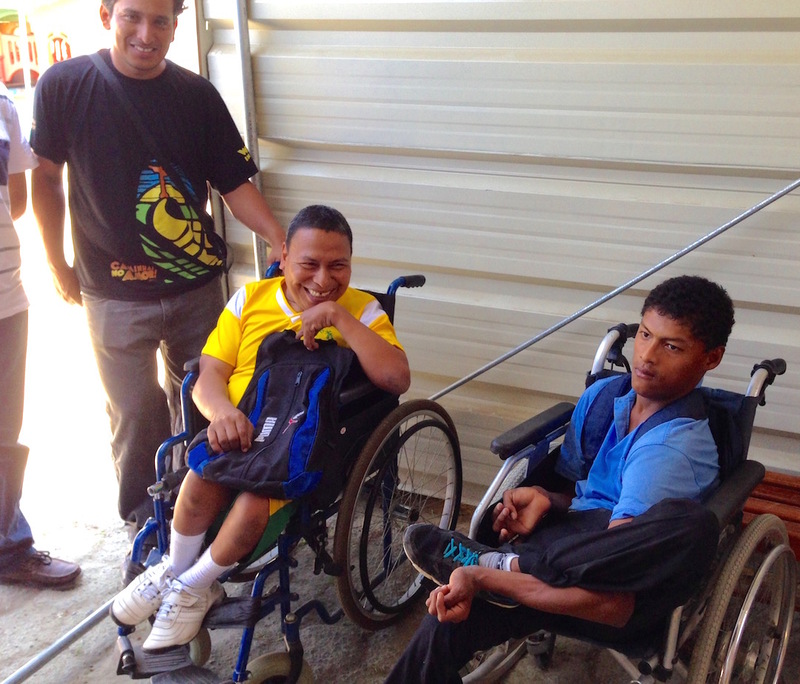 SCJs continue to serve victims of Ecuador’s earthquakes | Walk with us! Fr. Bruno and Fr. Jose Luis pack a truck of relief supplies. A one-hour plane trip from Quito landed us in Manta, the airport nearest Bahía de Caráquez. On April 26, an earthquake of 7.8 on the Richter scale heavily damaged the entire region. It is fortunate that the earthquake hit on a Saturday evening when many people were out and about town, and not home sleeping or at school or work. The airport’s control tower collapsed and a temporary mobile military tower is in its place. The waiting area was a series of four large tents. A camcorder on a tripod served as the security camera. Porters delivered our baggage by hand because the conveyor belts were not yet rebuilt. Fr. Bruno Roque dos Santos, originally from Brazil, and Fr. 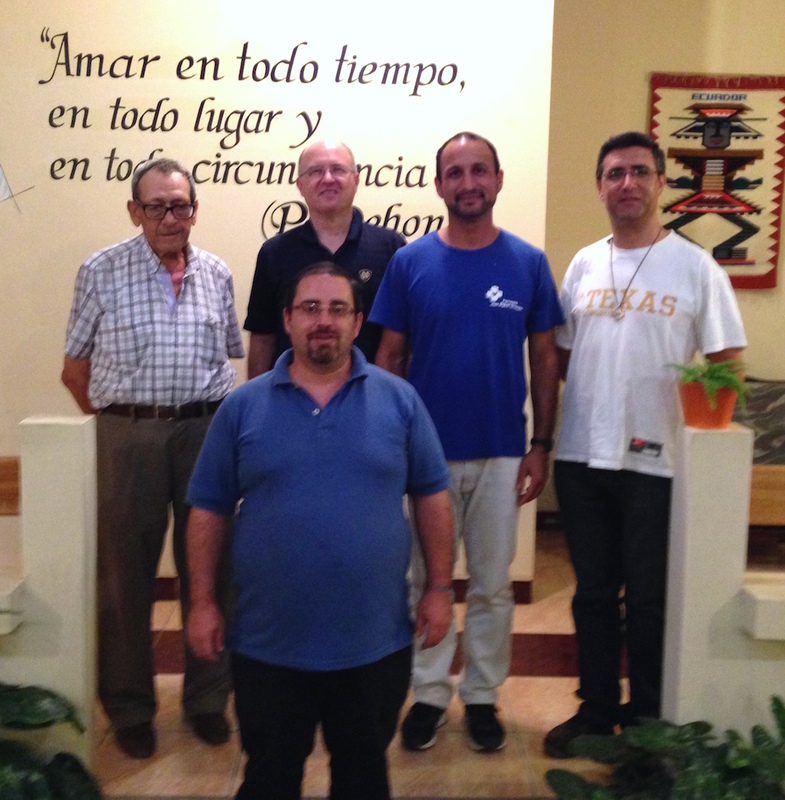 Ramón Soriano Gil, one of the three re-founders of the Ecuador District, met us and drove us north along the coast, past palm and mangrove trees to the area where SCJ missionaries first landed in 1897. Because Ecuador was the first nation consecrated to the Sacred Heart, it had special significance for Fr. Dehon. The SCJs now serve three parishes with an additional nine chapels. Fr. Bruno has three roles: parish pastor, superior of the religious community, and dean of the vicariate for the diocese. Normally he thrives on lots of activity, but the earthquake relief work has at times left him feeling drained. The Church has been a reliable institution in which relief groups can turn to in order to put food and relief supplies directly into the hands of those who need it most. Fr. Ramón is in his late 70s and after almost 20 years of walking barrios and visiting the sick, he is well known and loved throughout the town. Sagrado Corazón (Leonidas Plaza) church parking lot was partially occupied by tent canopies. A dozen children were taking part in their Saturday catechism classes. The high school students are preparing for confirmation, and the younger students learned about the Trinity. Their normal classrooms are still under repair. Cracks in the church were visible, and it cannot be used for liturgies until structural damage is repaired and the roof replaced with lighter materials. In the meantime, the church has become a staging area for relief supplies. Inside I found cement bags and diapers, coloring books and cooking oil, beds and mattresses, blankets and bottled water. We drove through town exploring the earthquake damage. Some entire blocks have been leveled. The worst hit seem to be the wealthier high-rises near the ocean, which are uninhabitable, and the poorer cement and brick homes built high on the hills which buckled and collapsed entirely when the earthquake and aftershocks hit. Ironically, many of the poorer homes in the country made of wood and cane survived because they are not rigid, and swayed and bent rather than broke. Roads buckled, and a major task has been repaving long stretches of highway, and in some cases, rerouting the roads. Tents and tarps abound. Three months after the earthquake people still live in temporary basic structures. Many residents have moved to other parts of the country away from the destruction. 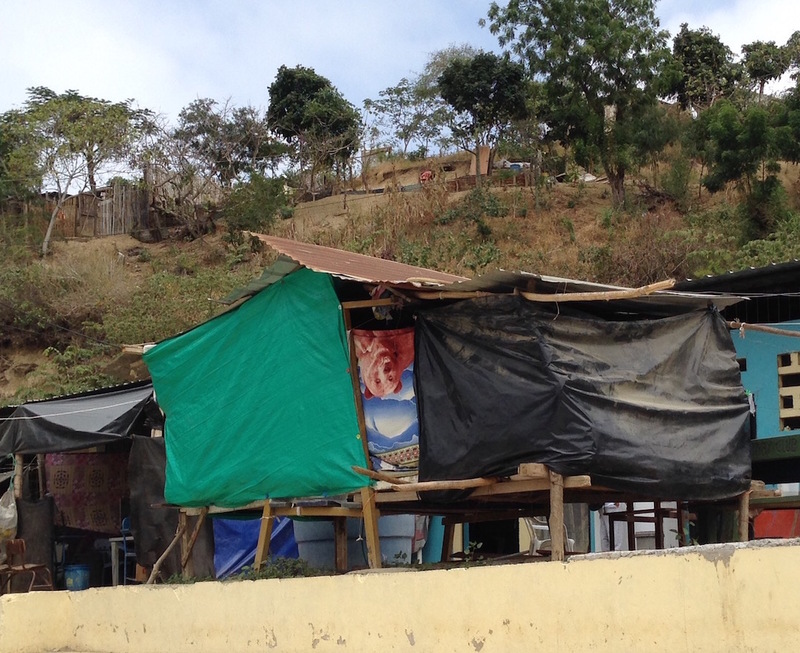 The economy is struggling in Ecuador as a whole, and the destruction here has only compounded the problem. For workers whose average salary is about $325 per month, home insurance was never possible. On a hill overlooking the city a large cross stands as a sign of faith and hope. The panoramic view was both beautiful and sad, because it gave a perspective of all the damage. In Bella Vista the chapel totally collapsed and has been demolished. There we visited a feeding program and saw many pre-school children eating lunch. The cooks also boxed up meals to be taken to the home bound elderly. We passed a high school, totally unusable. An empty lot stood where another school has already been leveled. When school starts again in a few months, where will the students attend classes? 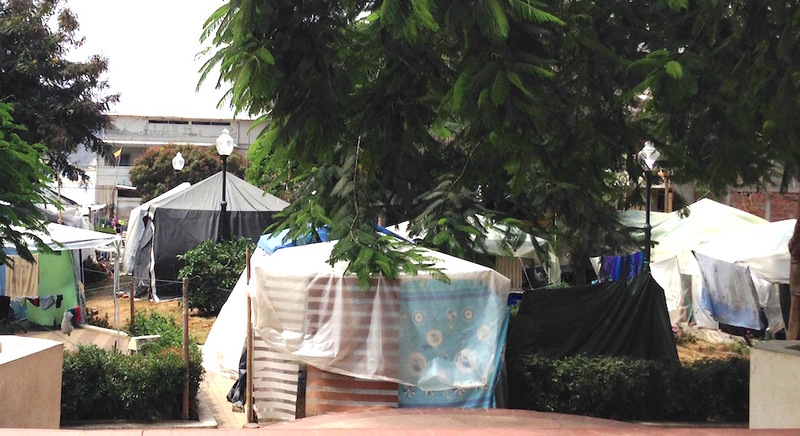 The plaza in front of Our Lady of Merced Church holds a tent city. We also passed rows of tents on the outskirts of town. At San Jorge church, we saw how the bell tower pulled away from the main building. The office and meeting room building slants noticeably. Workers laid new floor tiles after leveling an eight-inch drop in the main floor. The disaster has caused lots of displacement for normal group meetings and parish programs. The Priests of the Sacred Heart have tried to help with housing. At Albergue Sagrado Corazón, one such temporary housing site, metal structures about the size of a backyard tool shed serve as shelter. Blankets draped over the metal add warmth and protection from the wind. People cooked and socialized outside. An elderly woman had her bed brought outside the house so she could be part of the crowd until it was time to go in for the night. While life is hard, people are grateful for the help with meeting basic needs for the moment. The town resounds with the sounds of both hammers and wrecking balls. We visited two housing construction sites. 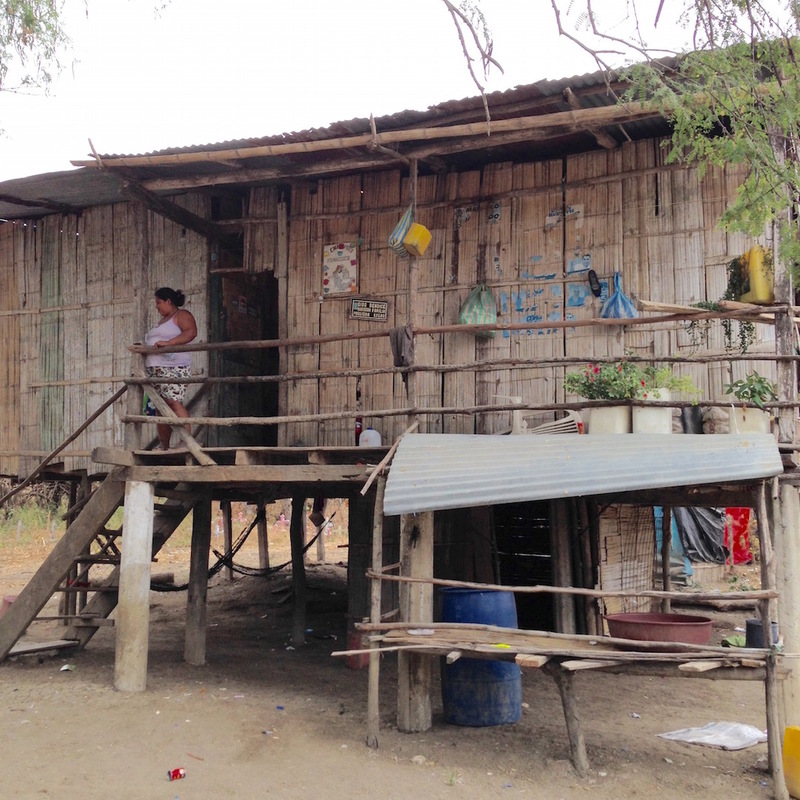 The SCJs have helped build 17 homes, which rise above cement pads on stilts, and are connected to water and sewer. They cost $3,000 each. At another site we watched workers cutting wire in preparation for prefabricated walls to be brought in. Those homes cost $8,000. In the aftermath of past earthquakes in Chile and Perú, builders have learned what can be quickly and inexpensively built that will work in the area. At St. Rose of Lima Church in neighboring San Vicente, we were invited to join a prayer circle of high school volunteers preparing for a service project in a badly damaged part of the region. As we formed a circle, arms draped over each other’s shoulders, I heard many heart-felt petitions as they recalled the needs of their community. Fr. Jónathan Martínez Gragera is from Spain and has served Bahía for the past six years. The earthquake followed the previous year’s drought, a double hardship for the people. The biggest pastoral challenge is to be a listening ear and support people who get discouraged and tempted to lose hope. After three months, so much yet remains to be done. As pastor, social worker, counselor and listening ear for so many traumatized people, it is a challenge. I saw Fr. 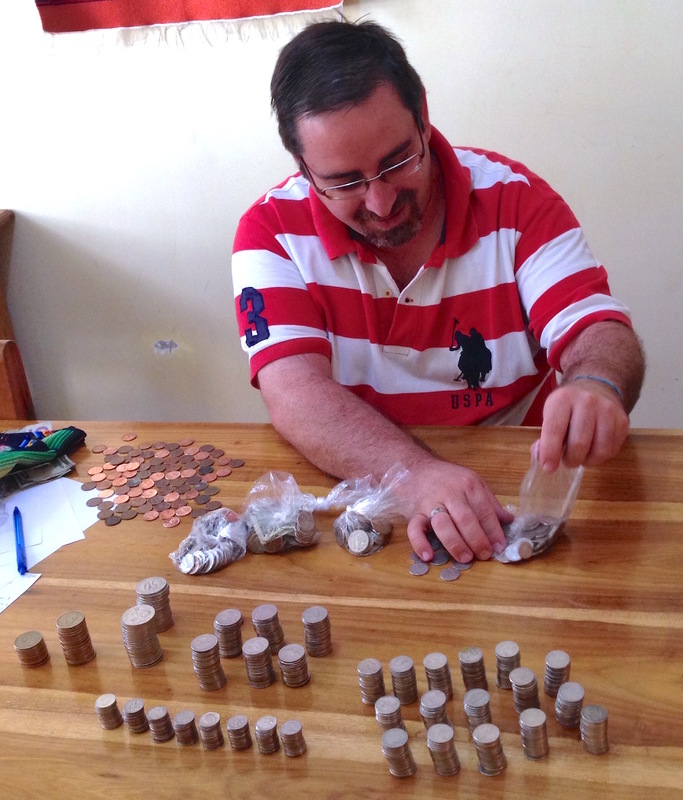 Jónathan counting the weekend collection. Amid a pile of coins, I saw two 5-dollar bills. The average salary here is about $75 per week, and the collection brought in $125. Ecuador uses US dollars as its currency. The Sacajawea dollars, which never caught on in the US, are commonly circulated here because of their durability. 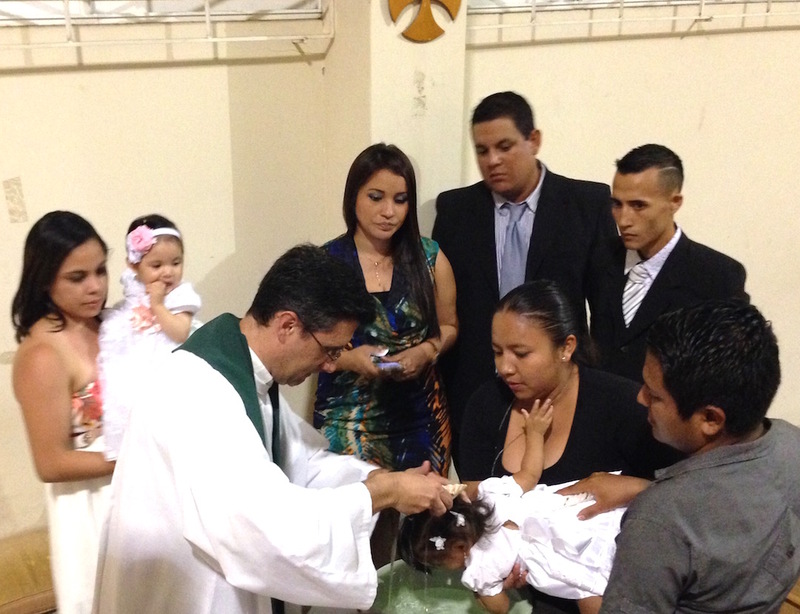 Carlos Alonzo Vargas, from Venezuela, has ministered as a deacon for over a year. He began work in Ecuador in March, just one month before the earthquake changed everything. Beside parochial ministry, he finds great meaning reaching out to the nearby prison. I celebrated weekend Masses in San Jorge parish. The SCJs invited me to preside, while they preached. I did say a few words about how our prayers and thoughts have been with them since the earthquake. My hope and prayer is that times of trouble and disaster can also be times of charity and solidarity with one another. The liturgies had lively music and participation. One Mass include two baptisms. At the children’s liturgy, we encountered enthusiastic singing and hand clapping. Ecuadoran culture is very affectionate, with lots of hugs and greetings. Many people line up after Mass for an extra, individual blessing and a few words of encouragement from their pastors. I observed catechism class La Virgen de Merced parish. The parish has an active Caritas group that reaches out to those in need with social projects, and they have been incredibly busy this year. Fr. Bruno honored the parish secretary for 21 years (and counting) of her service at Merced. 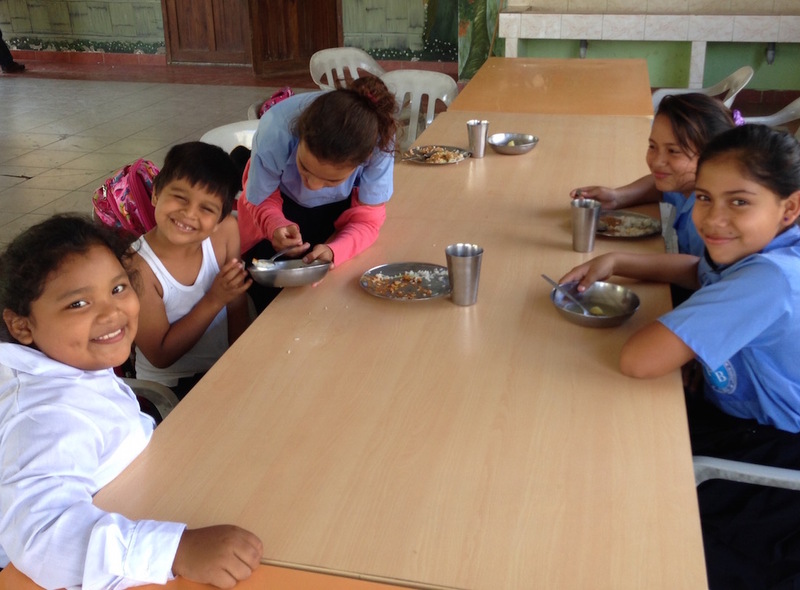 An ongoing project are the parish soup kitchens – “comedores.” In one near Sagrado Corazón women prepare daily meals for area children. While absolute hunger is not an issue in this agricultural region, good nutrition is, and they are able to provide nutritious meals to supplement what is lacking. Talitha Kum, (from the biblical stand and walk) provides classes and care for children with physical or mental developmental disabilities. We talked to youth confined to wheelchairs, and others with Down’s Syndrome or Autism. The tiny metal sheds serving as classrooms didn’t seem like a lot, but the love and care inside was noticeable, and that makes all the difference. One night we enjoyed supper with the Visitation Sisters, who have moved into the SCJs’ Dormus Cordi house after their convent walls crumbled. Dormus Cordi normally serves as a center for youth ministry. I was disappointed that much of that ministry is on hold until the fall, and I hope to see and learn more about it on my next visit. Fr. 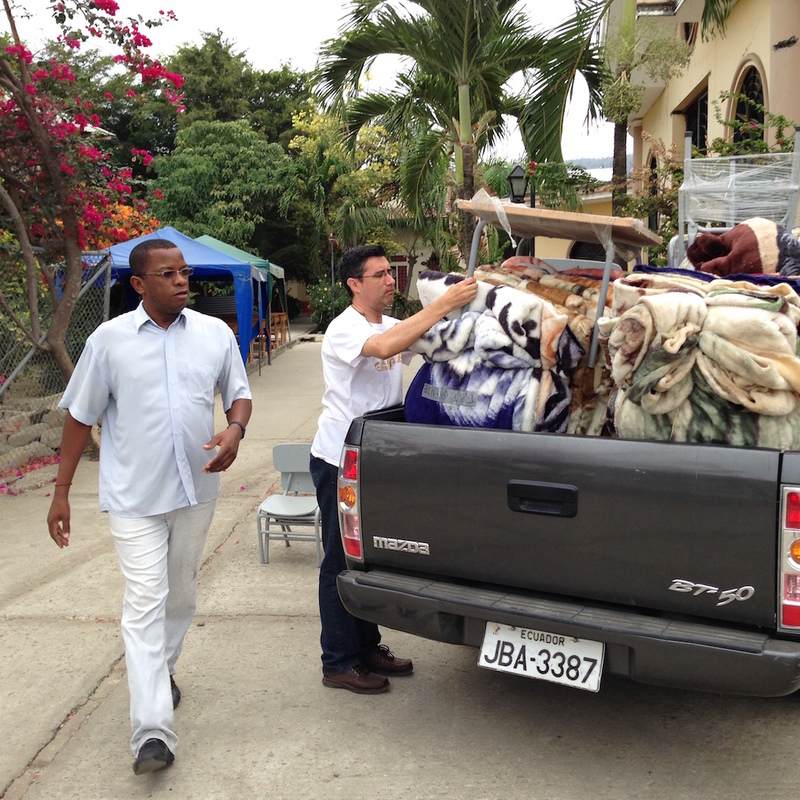 Bruno loaded up a truck of supplies for the countryside (campo) communities. We traveled dirt and gravel roads, as rugged as any I knew from my rural South Dakota reservation days. We dropped off tables and tiny chairs to help a pre-school program. We delivered a bed and mattress to a 95-year-old elder in the community. His home was made of traditional wood, on stilts to keep cool air flowing underneath and to minimize the critters that can get in. Newspapers glued over the cracks kept the wind down. It was a simple home about 30 x 30 square feet divided into four rooms. They had no running water. The hospitality was great as we were greeted with a quarter of a watermelon apiece, warm hugs and a huge smile. In Santa María the small chapel that serves the 50 families in the area was next to a one-room school house, in session. There were 19 children studying. One girl was late (chronically) because she has to walk six kilometers (a little under four miles) each way to school every day. Near the community of Pajonal we walked along the oceanfront, quite beautiful and undeveloped. People here worry about large conglomerates buying large tracts of land and privatizing the beaches. Besides my meetings with individual SCJs, the community as a whole met to discuss the General Council’s six-year plan. They inquired about our SCJ confreres and projects throughout the world. Ready to contribute what they can to the Congregation as a whole, they asked what the General Superior hopes from them. Again, I heard their desire to promote the district to other SCJs who may be willing to join their ministry. 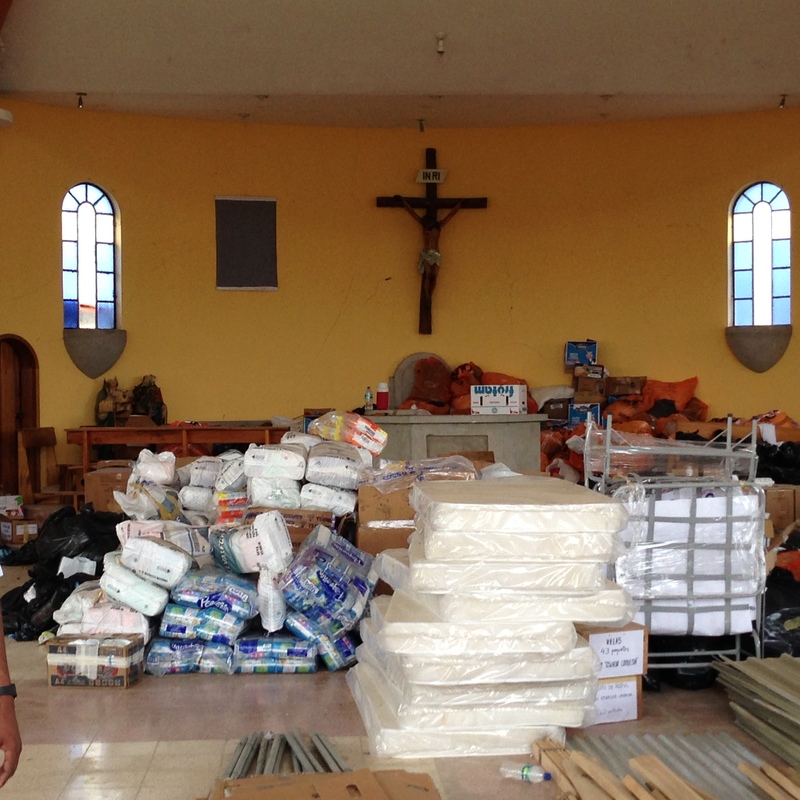 Click here to learn how you can contribute to relief efforts in Ecuador. Many people were so generous immediately after the disaster, but as you can see in Fr. Steve’s account, much still needs to be done. Thank you for continuing to keep the people of Ecuador in your prayers.